“Old School at Mount Sophia is one of the few places left in Singapore that exuberates an enchanting and undemanding atmosphere, out of the hustle and bustle of the city. It is a treasure trove and you never know when you might stumble across an arts exhibit or movie screening here. Chalk Restaurant does well too to blend into this serene setting and at the same time, promises patrons a gastronomic dining experience. First thing that struck me was the chic ambience. Not overly posh but with the feel of a mid-upper range restaurant. Lightings were dim which contributed to the relaxed and tranquil nature of the eatery. The kitchen has an open concept which allows patrons to marvel at the mastery of the chefs. There is also an extensive wine selection here with all the wine placed at a nice rustic corner of the restaurant for patrons to pick their poison. Only downside I noticed was that noise levels can get a bit on the high side.” -excerpts from my past review of Chalk on Hungrygowhere. One of my favourite restaurants, Chalk is relatively hidden from the masses(mainly due to it’s inaccessability by public transport and the deterring 136 step climp up the “Stairway to Heaven” to Mount Sophia’s Old School for non-drivers, definitely not for the faint-hearted). I was here this time on a double date, with my vertically-challenged ex-canoeist CCA mate and fellow soon to be SMU freshie Justin and his lovely also equally vertically-challenged gf Elsia, and Chalk provides the atmostphere for such a meetup. It’s not posh enough to rouse one’s insecurity but elegant and cosy enough for a nice dinner among friends and loved ones. Rawrrrr! I was in a foul mood because I left my Panasonic Lumix LX3 at home which I normally use. I find it compact and light enough compared to DSLRs yet still functional for basic food photography. Anyway, I had to make do with S’s ancient vintage compact camera instead so I apologize for the poorly taken pics to come. At least it’s better than my 3.2Megapixel Camera Phone so let’s be THANKFUL! Pizzas clearly aren’t the forte here. 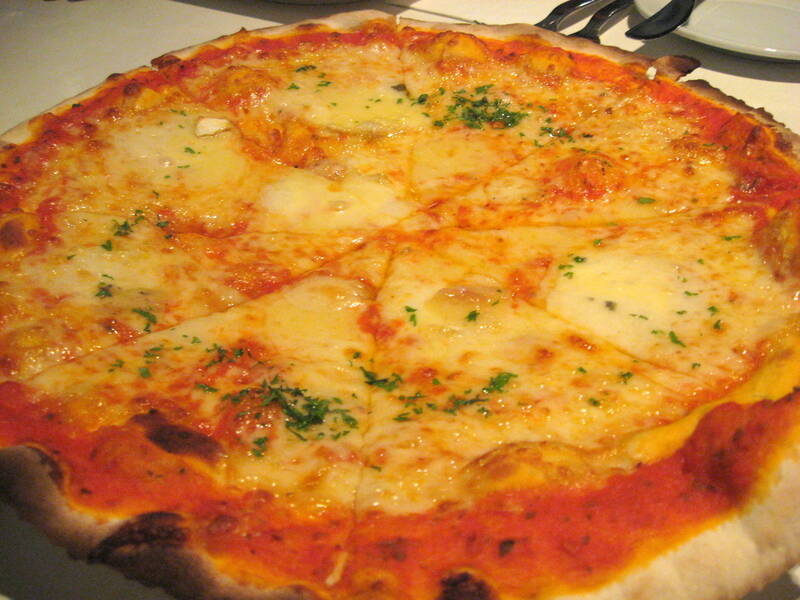 We had the 4-cheese pizza($20++) which I felt lacked depth and came across to me as being very one-dimensional in taste. Probably no one will understand my rantings so I will put this way. There are 3 types of pizzas; The great, the average and the scum of the earth. The one here was just a thin-crusted average. 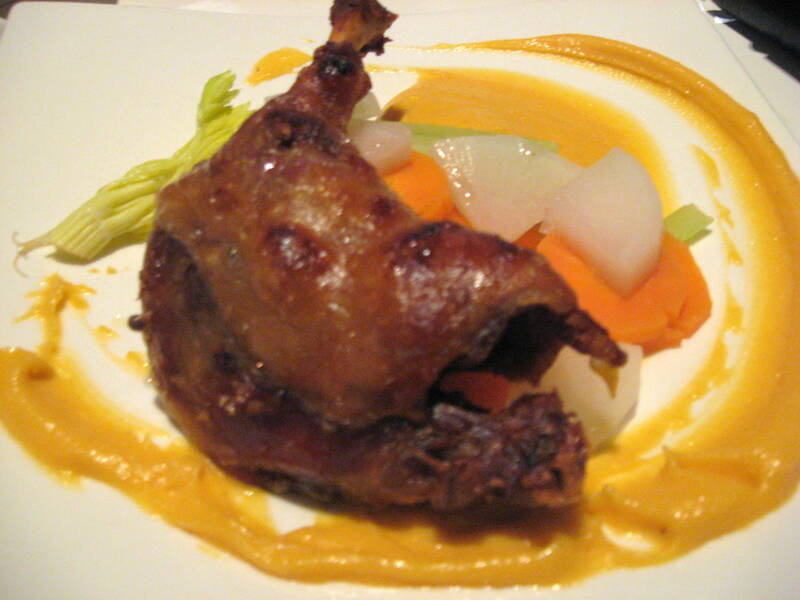 While I don’t want to believe it, I’m forced to come to terms that Chalk’s Duck Confit with Sweet Potato Mash($30++) is just not good as it used to. Or maybe because I have just found better elsewhere. Actually, it’s probably both. Chalk’s rendition is dry for the most part, too salty for my tastebuds(though the mash does provide some relief) and the portion was also undeceptively shrivelled and rather petite. That said, I have heard great things about Saint Pierre’s Duck Confit available in their weekday set lunch and I’m eyeing that as a potentially sustainable alternative for all Duck Confit enthusiasts! Fortunately, Justin has a penchant for a nice beef stew and ordered it, causing any disappointments I have had till now to fade into obscurity. The Beef Stew with Red Wine Sauce($28++) was absolutely stellar! 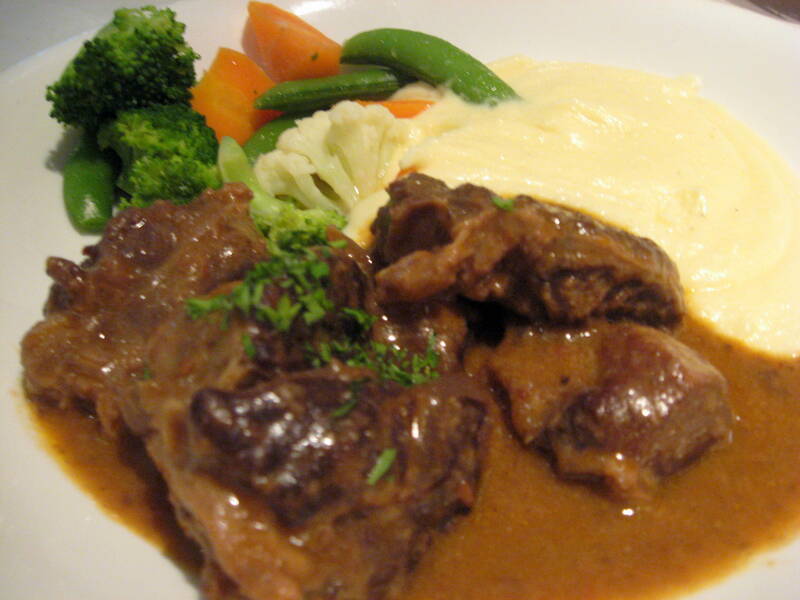 I couldn’t ask for more; The beef was tender, it’s flavours robust and though the velvety mash was slightly bland on it’s own, dipping it in red wine sauce really works wonders. My first love, an old flame. Drifted apart yet with latent feelings that have ceased to diminish. Of course, I have gotten in and out of relationships since but at the back of your mind, she had always been the benchmark to beat. I have always been on the lookout for someone similar in tastes, character and background but I have not found anyone as genuinely warm and uncloyingly sweet. A year’s past before I saw her again. Pent up emotions gushed forth like the escaping crude from BP’s oil well off the gulf of Mexico and I unleashed a smile that extended from ear to ear. 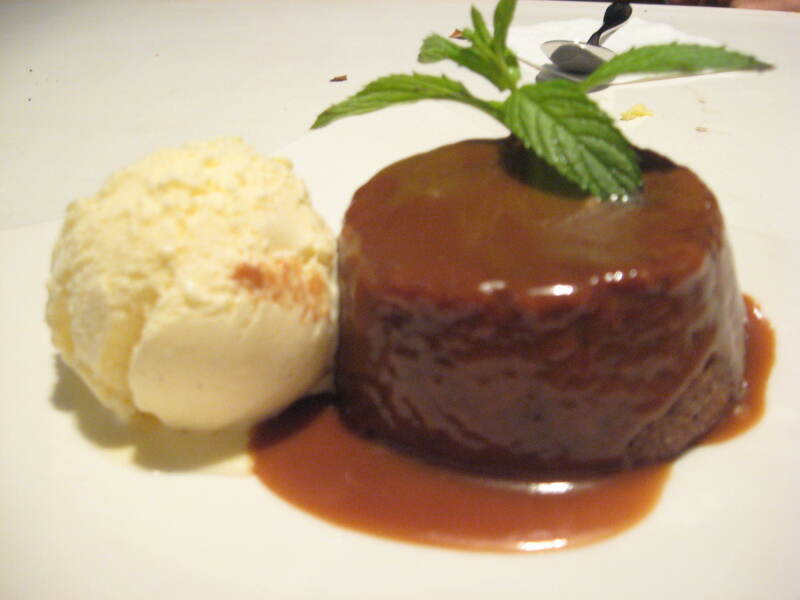 My mouth met hers and a tear slid down my cheeks, with the thankful realisation; I was lost but now am found…The Sticky Date Pudding with Ginger Ice-Cream($13++). We requested to change the ice-cream to vanilla and it ended up being a bit too sweet to me compared to the ginger ice cream. It’s a match made in heaven, sweet and utter bliss. I had high hopes for the Passionfruit Souffle with Vanilla Anglaise($13++). After all, we waited 25 minutes after our mains while it was being freshly baked in the oven. 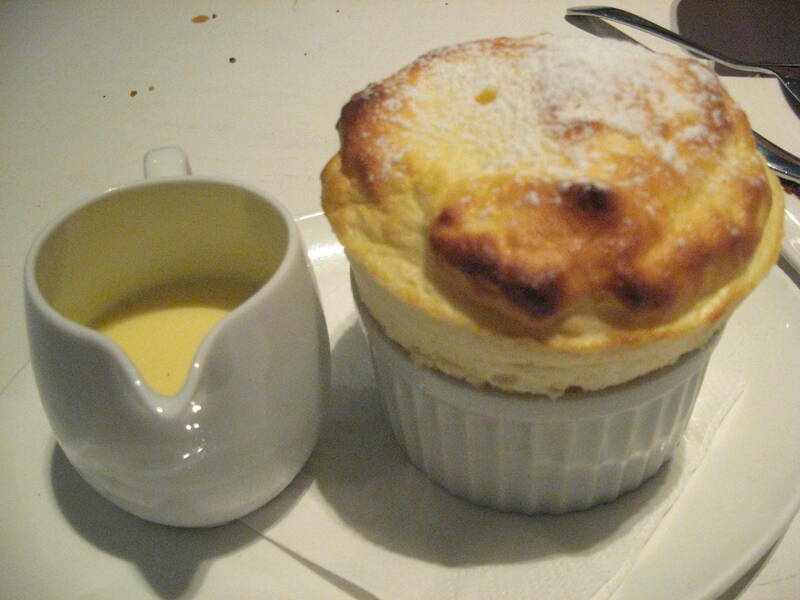 Refreshing and light, it had all the attributes of a well-executed souffle. Everyone liked it but me though(passionfruit really isn’t my thing). Beauty does indeed lie in the eyes of the Beholder. Amid some minor disappointments, I’m left with 2 lingering thoughts. 1) If my school ever had Chalk Restaurant in it, I wouldn’t have ponned school so often. Categories : All YumYums in my TumTum, Cuisine Type YumYums, Desserts, Dhoby Ghaut, Italian, Location of YumYum, Western, Yummy! Sounds like a nice place for a romantic date! Be sure to check out the compact cameras website to find out more information, products and reviews for all kinds of cameras. the pictures here are pretty bad but thx for the camera website!